The Center for World Music’s World Music in the Schools is delighted to profile teaching artist Dr. Clinton Davis, who is cultivating the next generation of audiences for traditional American music in San Diego. Clinton Davis is a multi-instrumentalist, composer, and educator. He was born and raised in Kentucky and now lives in San Diego, California. A fifth-generation Kentuckian, Davis grew up in Carroll County with faint residues of old-time music lingering in the air. 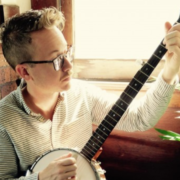 With guitar, banjo, fiddle, harmonica, mandolin, and piano, Clinton sifts through America’s musical past. With the G Burns Jug Band, Davis arranges music of country, blues, and jazz greats from before World War II for a five-piece ensemble. Their second album received a San Diego Music Award. Clinton is an enthusiastic scholar and singer of American shape-note music, traveling to every corner of the country to sing these unique tunes of a cappella harmony with others. In the summers of 2013 and 2014, he toured the Sand Mountain region of Alabama. There, he immersed himself in singing that has existed as an unbroken tradition for over 150 years. In 2015, Clinton became an official Deering Artist, partnering with the Deering Banjo Company and appearing in their catalog to showcase their Goodtime Americana line of banjos. In 2016, Clinton earned his doctorate in music at the University of California, San Diego. He served as an associate instructor at UCSD, leading a survey course in American roots music. 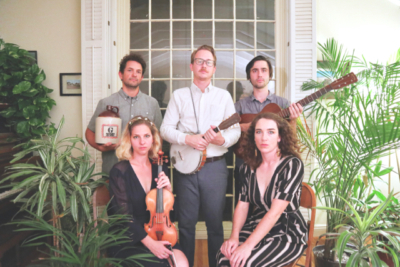 Beginning in 2017, Clinton has presented a series of concerts called the Southern Pacific Sessions, featuring a variety of musicians performing traditional American music at Kalabash Music & Arts in the Bird Rock neighborhood of San Diego. 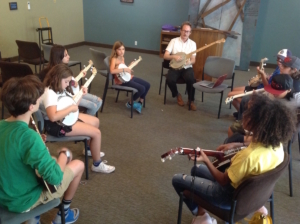 Clinton teaches private music lessons and leads middle school clawhammer-style banjo classes as a teaching artist for the CWM’s World Music in the Schools program. If you want to catch Clinton performing, check out his upcoming gigs, along with a plethora of other gems on his website, www.clintonrossdavis.com. Enjoy this YouTube video of Clinton performing Kenesaw Mountain Rag with G Burns Jug Band.